Adapted from an article originally published in the summer 2018 issue of Association magazine. No one stays in a job forever. And most people would agree that it’s probably a good thing they don’t. In North America, like many areas across the globe, the median age of CEOs of the largest companies has risen over the last 10 years. Within Canada’s Not-for-Profit (NFP) sector, retirements and leadership transitions are on the rise. Given that the non-profit sector in Canada currently accounts for $169.2 billion or 8.5% of the country’s annual GDP, changes within the sector can have considerable economic impact. Ready or not, here change comes. Why does the transition from one leader to another prove to be a challenge for so many organizations? For one, it’s a transition that we may not commonly face. Across Canada, nearly a quarter of all not-for-profit Chief Executives have been in their current role for more than a decade. Within Canadian Associations, an astounding 38% of Chief Executives have been at the helm of their organization for 10+ years. When a leader that holds significant institutional history, knowledge and legacy is stepping down, transition planning becomes all the more important. Regardless of whether an internal or external candidate is selected as the successor, anticipating their arrival and devising comprehensive onboarding in a deliberate way can make the difference between your new leader becoming a high-performing, well-adjusted successor or an “unintended interim” for the organization. Successful hiring is the starting line to an effective onboarding program, but what deserves equal attention is what happens after you’ve found your next leader. Why is it that some organizations cope far better than others when it comes to bringing on a new leader? There is no cookie-cutter recipe for acquiring and onboarding a Chief Executive in the Not-for-Profit sector, but a successful outcome can be directly supported by three key elements in the transition process: Proactive Planning, Shifting Focus and Transferring Relationships. Careful attention to these elements can help ensure the best outcome possible for the new successor and, by extension, the organization. When burning issues and priorities abound, worthwhile tasks related to proactive planning can collect dust on our “to do” lists. Proactive succession planning initiatives are a smart idea for any organization (as most any management book on the topic will tell you), but when looking at bringing on a new Chief Executive, planning for onboarding is more than just helpful, it is essential. Skipping this step can have very costly consequences for the organization in the form of employee turnover, reduced employee engagement and lost productivity. The Society of Human Resource Management (SHRM.org) cites that effective onboarding improves retention rates and a new employee’s time to productivity. Further, long-term outcomes of good onboarding include increased job satisfaction and organizational commitment. an information plan for determining what information/documentation should be shared with the new leader in advance of their start date, once they arrive, and within the first weeks, to help them become as familiar as possible with the organization and role. It’s no secret that the most successful transitions include a plan for a comprehensive, timely and tailored onboarding process. Distinct from orientation (which is a one-time event on the new hire’s first day), onboarding is a process, and one that starts as soon as an employment agreement is signed and continues for at least 6 months. During a time of transition to a new leader, clarity on who has authority and accountability within the organization is crucial. Who is responsible for the Annual General Meeting happening next month? Who should handle a pressing HR issue? Establishing what authority the Board is giving the Chief Executive and what authority it is retaining throughout the transition and onboarding months is critical and must be clearly understood by all involved. If there is an overlap between the outgoing leader and the incoming leader, the two should establish and agree to a direct plan for who will handle what, until when, and with what consultation. Staff should also know to whom they should be directing their queries. When the accountability shifts, so too should the title. In the most effective transitions, the outgoing leader has changed their email signature to “consultant” as soon as this handover of authority is made. During this time of transition, the outgoing leader shifts their focus from doing to coaching the new leader. Just as looking at someone else lifting weights won’t help you build muscles, the new leader should approach the transition from a perspective of wanting to learn, get involved and take action. As a final step, the two leaders should agree on parameters for the outgoing executive’s role after leaving the organization. What would an emeritus role look like? What boundaries should be maintained? After the former leader has left the organization, if they are to remain involved, it’s advisable that their role be as a support and resource, rather than mentorship. This initiative involves intentionally arranging meetings, conversations and time together where individual or small groups of stakeholders can get to know the successor with the support and facilitation of the outgoing leader. The most successful organizations begin this process as soon as the new leader has been hired, taking advantage of key events and meetings to introduce and welcome the new leader, while also using the opportunity to celebrate the contributions of the outgoing leader. Careful consideration should also be given to how the new leader will be introduced to the Association’s member community. Facilitating a great first impression with members can go a long way to helping the new leader begin their journey and thrive. Plans are only ever as good as their execution. As onboarding continues through the first 4 to 6 months of the leader’s tenure, the best transitions include regular opportunities for formal and informal feedback from key stakeholders. Similarly, ensuring that a plan for the review of the new Chief Executive’s performance is in place will help everyone, including the executive, to understand what is expected. Supporting your new leader through the transition into your Association is perhaps the best head start you can offer them, and one that has lasting impact. Change brings opportunity. Most leaders and Boards would concede that a degree of change and turnover at the senior levels is a natural part of any organization’s rejuvenation and can help spur innovation, adaptation and momentum. The Non-profit organizations that embrace this reality and keep an awareness of what lies beyond the horizon are more likely to succeed through leadership transitions and be rewarded in the process. Suzanne Clark is a Partner at Four Corners Group, the Canadian representative of InterSearch, where she oversees the firm’s Not-for-Profit and Academic Search Practice. It is with great pleasure we welcome Satinder Singh to Four Corners Group. Satinder Singh is a Principal with Four Corners Group, assisting clients with attracting and hiring top talent. Satinder’s experience spans a diverse set of industry verticals, including Fortune 500, private, publicly traded, not-for-profit, government and private backed companies. Core areas of functional expertise include CFOs, CAOs, risk management, audit, compliance, corporate development and corporate strategy. Satinder has continuously delivered exceptional outcomes for her clients, due to her expertise in research, sourcing and her ability to build sustainable relationships with both clients and candidates. Prior to joining Four Corners Group, Satinder was a Senior Recruiter with a Korn Ferry, a global executive search firm. Satinder began her career in finance with Deloitte and PwC, where she assisted with various transfer pricing engagements for both private and public companies. Satinder Holds a Bachelor of Arts Degree from York University, specializing in Business. Outside of work she enjoys travelling, cooking and spending time with her family. Four Corners Group is pleased to highlight Diversity and Inclusion (D&I) initiatives in our firm and with Intersearch World Wide Operations. Since 2007, we have demonstrated our commitment to D&I through our firm’s Value Statement – We Value Diversity. We not only assist our clients in this regard, but we put these efforts into practice in a meaningful way within our own organization. D&I has proven to give businesses a critical advantage and we are pleased to continue to make this a top priority…to help clients realize the full potential of a diverse and inclusive workforce. Our Partner, Pamela Colquhoun, is the D&I Practice Lead for Intersearch World Wide Operations. 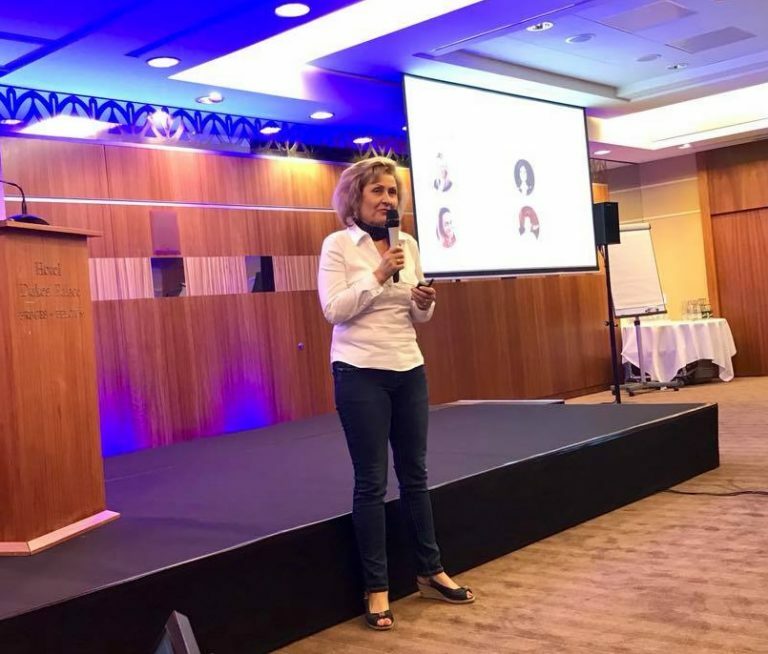 D&I Regional Sub-lead Judit Hegedus of Hungary presented the Importance of D&I in Search on behalf of the Practice Group at the recent Intersearch Conference in Belgium (see below). Four Corners Group is pleased to be selected to execute this important search for an inaugural CEO for this provincial health care organization. Scheduling when the personal support worker provides personal support services to the client. SDCO operates in the home care sector and is required to work with the Local Health Integration Networks (LHINs) to provide services to eligible clients. SDCO will begin delivering initial services to select areas in the province by Spring 2018 with province wide services to be fully implemented in 2021. An inaugural CEO is sought for this trailblazing service organization. In the ideal, you have senior level leadership experience in the broader home care/community care sector, with a penchant for operational excellence. Start-up experience is highly desirable, as is experience working with a board(s). A skilled negotiator, and politically astute, you are adept at navigating the interstitial space enveloping the Ministry of Health and Long-Term Care, the LHINs, home care agencies, personal support workers, and the clients for whom this organization was established to serve. With proven business acumen, and the ability to finesse multiple stakeholder relationships, you know how to energize this novel centralized employer agency which fulfills a policy commitment set out in the Ministry’s Patients First: A Roadmap to Strengthen Home and Community Care. Warmest Wishes for the Holiday Season from all of us at Four Corners Group! Four Corners Group is pleased to share that the Ontario Chief Scientist search has come to successful conclusion with the appointment of Dr. Molly Shoichet to the role. Shoichet is a Professor at the University of Toronto and an award-winning expert in the area of polymers for drug delivery and tissue regeneration. Talk of public perceptions and interest in science for Ontarians was recently brought into focus through the Ontario Science Centre’s second annual science literacy survey, which found that while 33% of Canadians consider themselves science illiterate, 8 out of 10 Canadians want to know more about science and how it affects our world. “An internationally respected and award-winning expert in the study of polymers for drug delivery and tissue regeneration, as a teacher, mentor and researcher Shoichet has demonstrated her dedication to the advancement of scientific knowledge and excellence. In the coming months, Shoichet will help develop Ontario’s strategic research agenda and grow the province’s reputation as a top destination for global research talent. The Chief Scientist will also provide advice informed by science to help government decision-makers tackle some of the greatest challenges of our time, such as climate change, aging populations and the impact of transformative technologies. Dr. Shoichet is the recipient of 43 prestigious national and international awards. In 2015, she was the North American Laureate for the L’Oreal-UNESCO for Women in Science and in 2017, she won the Killam Prize in Engineering, the most important engineering prize in Canada. She is the only person ever to be inducted into all three of Canada’s National Academies: the Canadian Academy of Sciences of the Royal Society of Canada, the Canadian Academy of Engineering, and the Canadian Academy of Health Sciences. Dr. Shoichet was appointed to the Order of Ontario in 2011. In 2013, her contributions to Canada’s innovation agenda and the advancement of knowledge were recognized with the QEII Diamond Jubilee Award. Four Corners Group is excited to announce that John Brea has joined our client, FirstService Residential, as North Region President. Four Corners Group is pleased to have led this extensive search, and is thrilled to have placed the successful candidate. FirstService reviewed a significant number of highly talented professionals each of whom displayed incredible enthusiasm for the opportunity. The North Region has been one of the fastest growing regions in the last few years and there continues to be tremendous upside in the region. To continue to support that growth, FirstService looks forward to leveraging John’s experience and depth of knowledge including operations, risk management, supply chain, customer service, process improvement, talent development, employee engagement, strategy and sales. John is an ideal culture fit for the FirstService team and exhibits the same enthusiasm for customer service and associate development that is the hallmark of FirstService. John previously spent 20 years at Walmart with leadership roles in Canada and Puerto Rico, and playing key roles in projects in Mexico, UK, Argentina and China. Most recently, as Head of Operations at Kent Building Supplies, Atlantic Canada’s largest big box home improvement retailer, John led process and customer service improvements as well as efficiency efforts in staff utilization. Please join us in congratulating John Brea on his new role with FirstService Residential. FirstService Residential is the leading property and community management company in North America, providing full-service, professional association management services to over 8,000 client associations. Each day, every member of the FirstService team strives to fulfill their mission – to deliver exceptional service and solutions that enhance the value of every property and the lifestyle of every resident in the communities they manage. About Four Corners Group Inc.
Four Corners Group Inc. is a leading executive search firm, respected nationally for providing high touch partner centric search services and innovative talent solutions and for delivering exceptional results. Founded in 2007, Four Corners Group has conducted hundreds of search assignments across diverse industries, with specialty focus in consumer goods, retail, real estate, healthcare, travel and tourism, not-for-profit, associations, academic, manufacturing, marketing services and professional services. Canadian owned and operated, Four Corners Group has offices in Toronto and Kitchener-Waterloo and its team of senior level professionals draws upon decades of experience. Four Corners Group offers a comprehensive range of talent solutions enabling your organization to recruit, attract and retain the best talent at all levels.